This unique race will be a six hour or three hour timed run taking place on mostly flat, nearly rock and root free, single track trails on the western side of Turkey mountain. The run will start on March 18, 2017 at 9:00 am, and finish at either noon for the three hour or 3:00 pm for the six hour. 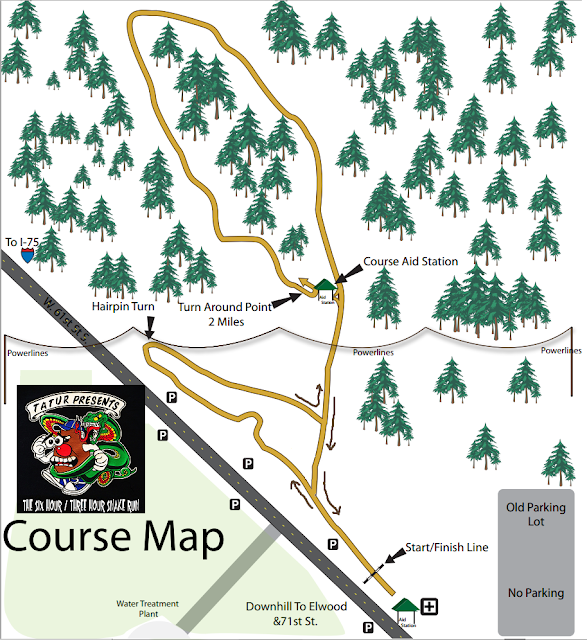 The course will head northwest from the old upper parking lot following some of the trails used in the Turkey and Taturs race including of course the Snake Trail. These are some of the smoothest and easiest trails on the "mountain". We also have taken great pains to remove all of the larger snakes from the course. Just kidding. Actually, the snake trail gets its name because it winds around like a snake, not because of an infestation of slithery reptiles! The course is actually an out-and-back, but for simplicity, we'll call it a loop. You will run 3.75 mile loops, hitting the turnaround in 2.1 miles, then you'll run then route in reverse. One section is bypassed on your return trip, and you/ll hit the start/finish after 3.75 miles. Then you do it all again. How many laps can you run in three or six hours? It's up to you. There will be 2 aid stations, one at the start/finish area near the old upper parking lot, and one at the turnaround. You do not have to run for the entire six or three hours. You can run one out and back, or run until you complete a 3.75 miles, or stop at a half marathon, a full marathon or even a 50K if you're real fast. The record for the six hour is 43 miles. First 220 entrants will receive a technical fabric T-shirt . You also will receive a medal that will have a front row spot in your trophy case. There are also terrifying trophies for the top three male and female in both events. Near the end of your event (three or six hours) you may feel you do not have time to complete another 3.75 mile loop. You can choose to run a short 1/2 mile loop and tack on as much mileage as you can during the last hour of your race. There is a lot of strategy near the end of the race. Choose wisely. Again, the winner is the one who after 6 or 3 hours covers the most miles. All past or present TATUR members receive a 15% discount, but you must email TZ trailzombie@yahoo.com for the promo code. The entry fee includes the shirt, medal, post race cookout and 2 awesome buffets of trail food and drinks. The way that the course is set-up you will hit the on-course aid station three times per circuit. Here are the mileages that you will receive aid. 1.1 miles is the furthest that you will have to run between aid stations. Therefore you do not have to carry a water bottle unless it is unseasonably warm. TATUR Aid stations are the best around. You will bacon, pancakes, boiled and salted potatoes Gatorade, water, chips pretzels, sweets etc. and drinks of varying octane levels. We will not have GU anywhere on the course. The trail in 2010 and 2012 was plagued with rain and mud and the area received over two inches of snow and rain before the 2012 event. The lesson is--do not wear your brand new shiny white running shoes. Trail shoes are totally optional. Come prepared! !